Unlock the power of complex data, such as the UK Biobank, with an enhanced platform for data science exploration, analysis, and discovery. We’ve added an innovative browser for clinico-genomic cohorts to DNAnexus Apollo, allowing easy at-scale navigation and exploration on combined genotypic and phenotypic data. The Regeneron Genetics Center successfully deployed the cohort browser on a collection of thousands of phenotypic fields extracted from the UK Biobank and millions of genetic variants computed through their scientific pipelines. What actionable information will you find in this rich and complex resource? Interested in piloting the cohort browser on your own approved UK Biobank data? Receive important updates from DNAnexus and claim exclusive access to new tools and product launches. Check the box below. Sign me Up! See the Cohort Browser in Action! The UK Biobank (UKB) has collected and developed a biospecimen and data resource on more than 500,000 individuals. It is of strategic importance to pharmaceutical companies, as it serves to understand how different factors influence disease. In collaboration with a consortium of pharmaceutical companies, the Regeneron Genetics Center (RGC) has undertaken the exome sequencing and analysis of all 500,000 samples, using the DNAnexus Platform to run Regeneron's software pipeline. 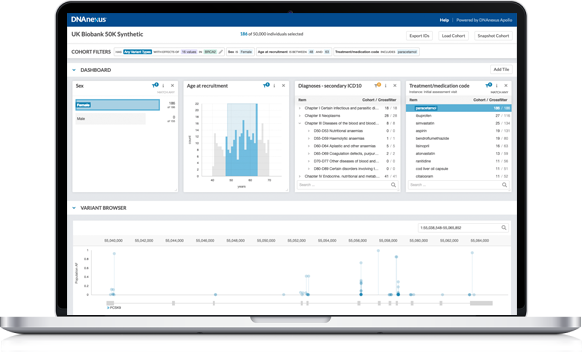 To increase value to the RGC UKB consortium, Regeneron and DNAnexus partnered to construct a combined database of the UKB genomic and phenotypic data to explore through an innovative cohort browser user interface. The UK Biobank is releasing a dataset of 50,000 exomes and combined phenotypes to the greater research community for the first time. Researchers with approved access can upload their UKB data to DNAnexus Apollo and use the cohort browser to accelerate research and discovery. Researchers interested in applying for access to the UK Biobank data can register here. Interested in piloting the cohort browswer on your own approved UK Biobank data?